Island in the Sky is a thousand foot high mesa in the isthmus between the Green and Colorado Rivers that forms one of Canyonlands National Park’s four distinct districts. There is excellent hiking on each side of the mesa, including this trail on the west side that circumnavigates Upheaval Dome. Once thought to be a collapsed salt dome, new geologic evidence appears to indicate an impact crater — either from a comet or meteor. This quite strenuous trek will test your mettle as you scramble up ledges, clamber over boulders and negotiate steep slickrock. As it loops around the dome crater, you will descend steeply down rugged Upheaval Canyon, then come back through The Breach on the other side via a beautiful and challenging route up the Syncline Valley. My brother Dave and I tackled this tester on Tuesday, April 28, 2015 from 7:00AM to 4:00PM. Our plan was to take the Syncline Loop in a clockwise direction, descending Upheaval Canyon and ascending Syncline Valley. We would also explore the crater spur trail at the midway point. Hike Rating: Extremely difficult and strenuous. Your route finding skills will be tested along with your stamina. Recommended for experienced hikers only. Trail Condition: Primitive. Red dust and sand, slickrock and layered strata. Starting Point: Syncline Loop Trailhead on Upheaval Dome Road. Trail Traffic: We encountered roughly two dozen other hearty souls. How to Get There: From Moab, UT take Hwy 191 north for 11 miles. Turn left onto UT-313 west and drive 14.6 miles. Continue straight onto Grand View Point Road for another 13.1 miles, passing through the national park entry station and Visitor Center along the way. Immediately after passing the Mesa Arch pullout, turn right on Upheaval Dome Road and travel 4.8 miles to the parking area. The trailhead is on the right side of the parking. Island in the Sky is a massive mesa with overlooks that peer into the Green and Colorado River canyons from 2,000 feet above, and trails that drop off the mesa. This made the third year in a row we have visited, thoroughly enjoying it each and every time. I’d seen the Upheaval Dome Overlook many years before, but this would be my first time into the canyon. When you hit the trailhead for Syncline Loop you can’t help but notice all the warning signs. Warnings that this is a primitive trail and that more hikers get lost here than anywhere else in Canyonlands. Warnings that this hike is hard, that it is strenuous, that you better be in good shape. Warnings to take plenty of water — however much you think you may need, take more. Warnings that it isn’t a good idea to do this hike in summer. It is, after all, the desert. So, you are forewarned. If none of that scares you off, then you are ready for some of the most unusual, remote, silent, adventuring in all of the American Southwest. Upheaval Dome is a wilderness of rock. The trail begins with a brief climb to the rim of the dome, and after a few minutes, your first view of canyon country. On a clear day in Canyonlands, you can see for 50 miles, or more. The area is surrounded by mesas and buttes, by snow capped mountains, and deep, dark canyons. The canyon you are about to enter is Upheaval Canyon, and if you have a backcountry permit, you can follow it all the way to the Green River. For Syncline Loop, though, no permit required. You can complete the loop in a day hike. As seen in this satellite view, the rim of Upheaval Dome is 3 miles across and over 1,000 feet above the core floor. The central peak in the core is 3,000 feet in diameter and rises 750 feet from the floor. 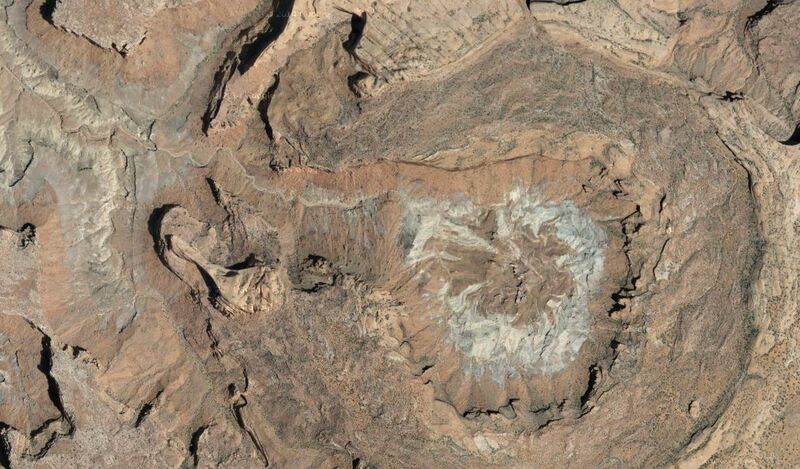 Since the late 1990s, the origin of the Upheaval Dome structure has been considered to be either a pinched-off salt dome or a complex meteorite impact crater. In 2007, German scientists reported finding quartz crystals that were “shocked” by the high pressure of a meteorite impact. 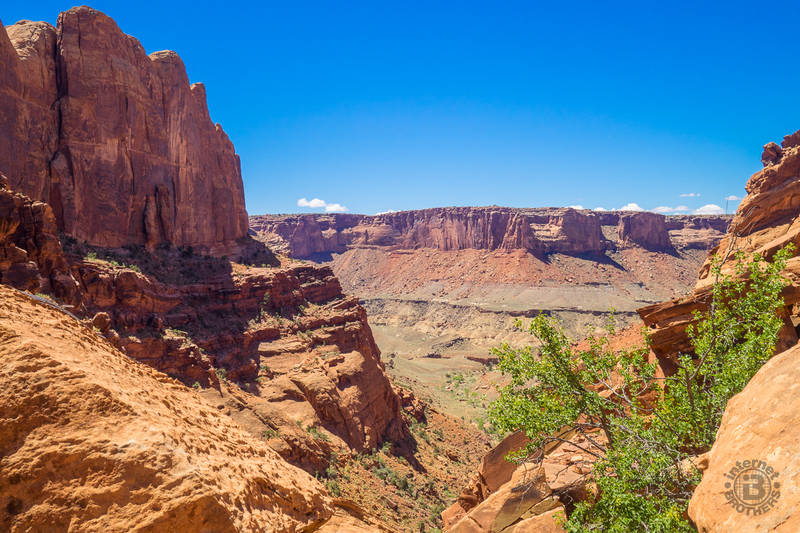 Many geologists now consider the mystery of Upheaval Dome’s origin to be solved. As we dove headlong into the canyon, we passed primrose and desert clover greeting the light of a new day. Starting just past dawn, the canyon was a sea of contrast. The west face along the Steer Mesa wall was awash in bright sunshine, while the rocky descent on our side of the canyon was still shadow cast. Oh that rocky descent. The trail here loses more than a thousand feet of elevation in slightly less than a mile. The trail gradiant is 22%. Remember that when you’re huffin’ and puffin’ on the longer, but more gradual ascent on the other side of the loop. After about a mile and a half of knee-wrecking, switchbacking descent, you’ll come to a small plateau in the syncline that I came to know as “the gap.” The photo at the top of this post was taken there. Click it for a larger image, and look for Dave standing on the edge of the next descent. We paused here for a snack and to rest our weary legs. Another hiking duo passed us here, the first we had seen so far. Make use of your rest, because the other side of the gap is more of the same, this time dropping through a rocky talus field. After another 20 minutes you will finally reach the level of the wash. While it is still down for awhile longer, at least it’s manageable. Unfortunately, now you get the other nemesis of desert hiking… soft sand. And, as with any hiking in desert washes, always be aware of the weather surrounding you. If you get caught in a flash flood, scurry to higher ground as fast as you can. Despite the softness of the sand in the wash, it was quite the relief on the lungs and legs. There was even the occasional small trickle of water, albeit covered in a thick layer of bright green algae. There is more vegetation here — cottonwoods, and tall wispy desert grass. Watch the geology change as you follow the wash from red sandstone to grey. During the meteor impact, the shale and rim sandstone were injected and pushed upward in a chaotic jumble. At the 3.1 mile mark, the wash comes to a junction of canyons, and of trails. On your left is Steer Mesa and on your right Bighorn Mesa. They disappear to the west, engulfing Upheaval Canyon. You can take the trail in that direction another seven round trip miles to the White Rim Road and the Green River Overlook. If you do so, this is where you might be thinking about that backcountry permit because you’re going to be adding several hours to your day. For this hike, though, take the right fork to stay on the Upheaval Canyon Trail and continue another 0.3 mile to the junction with the other half of the Syncline Loop. There is a bit of a climb here, up a series of well-built steps that someone spent a lot of time working on. Beware of a false trail at the top of the stairs that goes to your left. We got off track for a few hundred feet. At the top of the stairs you want to continue going up and over, and into another wide, sandy wash that worms its way between two tall columns standing guard over the entrance to Upheaval Crater. The backcountry campsite is here as well. They picked a remarkable spot for the lone backcountry campsite. 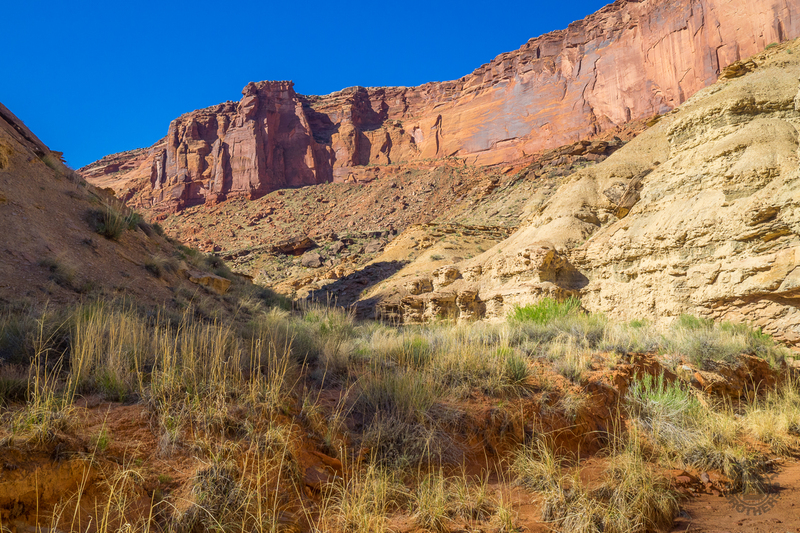 Near the mouth of Upheaval Dome, it offers a magnificent view of the the sandstone walls that surround the crater. The spur trail inside the crater is a mere hundred yards from the campsite, enabling an evening exploration after you have your tent setup. My brother has camped here, and he tells me the stars are uncanny, and the silence makes you feel like you are totally alone in the world. We stopped at this picturesque location for lunch. Other hikers began to arrive from Syncline Valley, having chosen to take the loop in the opposite direction. There were flowering barrel and claret cup cactus scattered all about, their shades of red and pink treating us to a desert bouquet. The stream bed near the campsite actually had some water, something Dave said he had not seen in his two previous trips to this spot. We took inventory of our energy level, trying to determine how far within the crater to proceed. We still had the entire outward climb ahead of us, so saving miles became an important priority. We decided to take the crater spur trail about ½ mile in, perhaps half of its total length. Inside the crater, you will see an abundance of white powder along the edge of the wash. That’s why scientists originally thought this was a collapsed salt dome. When we returned to the main loop trail, it was time for this hike to resume in earnest. It starts out innocently enough, following the creek through sage and the occasional cottonwood. The canyon narrows, and then stares you right in the face. There is an imposing wall of uneven strata that climbs mercilessly to a notch in the canyon some 500 feet above. Talus, boulders, cracks, ledges. You will be presented with every bouldering obstacle you can think of for the next quarter mile. You will crawl under boulders with barely enough room for you and your pack. You will shimmy between rocks while looking for the next foot hold. We welcomed other folks who were coming down as we were going up. It gave us a chance to pause for a breather, and survey the stunning valley below. This one quarter mile stretch has a 35% grade. If your muscles aren’t warm and limber, and aching and screaming when you reach the notch, then you must be 40 years younger than me. It’s kinda worth all the exertion when you reach the top of the notch. The view behind you, down canyon of the valley below, is exhilarating. But that climb to this point takes a toll, at least it did for me. It really sapped my strength, and I struggled for the remainder of the ascent back up through Syncline Valley. Just to dampen your spirit even more, after reaching the canyon notch, the trail descends about 50 feet meaning you will have to regain that lost altitude at some point later. The good news, though, the worst is over. There’s plenty more climbing ahead, but not quite so strenuous. For the next mile or so, the trail mellows considerably, meandering through meadows of tall grass and creosote. Wow, the creosote. We were fortunate to hit it in full, glorious golden bloom. Keep that in mind when you plan the timing of your visit here. Dave calls this stretch of Syncline Valley “The Oasis.” The description is apt. It is amazingly green for a desert canyon. Occasional pools of water are what attract the riparian vegetation. Filled with sage and cottonwood, tall desert grass and the ubiquitous creosote, the pathway through the valley is quite a relief following the previous strenuous climb. Don’t get too comfortable, however, because the next obstacle in your path is The Breach. This narrow canyon is a break through the walls of Upheaval Dome, and it is up, up, up again. More bouldering, seemingly relentless… but at least not as steep as before. When you finally clear all the boulders, then you’re faced with slickrock. After the notch climb sapped most of my energy, this hike through The Breach was frankly exhausting. 20 steps up, then 10 deep breaths. 15 more steps up, then drink 4 ounces of water. Finally, when you can see the rim of Upheaval Dome, the worst of the climbing is over. It’s still two miles of tedious dusty trodding through fields of cryptobiotic soil, surrounded by the white sandstone of the Kayenta layer. Dave says you can go over the dome rim here and drop down into Taylor Canyon, another of the many engaging features in the area. I suggested perhaps we could tackle that counterclockwise sometime in the future. So much to do in Canyonlands, so little time before we get too old. I got a lift when I saw the parking lot at the trailhead. I was definitely ready for this hike to be over. Originally, I had planned to hike the quarter mile and 200 feet up to the Upheaval Dome Overlook, so I could see what we had just circled. Phut! Forget that. Dave and I had been there some 15 years earlier on a previous visit. No need now. I hit the cooler in the car for ice and cold, cold water. OK, let’s summarize. This hike is hard. In fact, it was almost too hard for me. I’ve been battling a thyroid issue, so my stamina hasn’t been quite the same as the last few years. Please make sure you are in very good shape before trying Syncline Loop. Take lots and lots of water with you. I know it’s heavy, but you will need it. I took four quarts and drank 3.5 of it. We saw water in the washes on this day in late April, but you can’t count on it. You need to pack in your water. If you are an inexperienced hiker, pass on this one, unless you have someone with you who knows this trail. You will need route finding skills; including the ability to locate cairns, use a compass when the cairns are missing, and stay calm in stressful situations. If you have extreme fear of heights, you may want to skip this hike too. The scrambling up from the valley floor to the notch can be pretty intense for those with acrophobia. Leave the kids at home. I would not recommend taking any children less that about 14 years of age on this hike. It’s simply too gnarly. That all sounds pretty negative doesn’t it? Maybe so, but it’s just a final warning. Yes, you will get very tired on this hike, but the reward is grand. The desert scenery is spectacular. You will be able to brag to your associates back home that you handled the hardest hike in Canyonlands National Park. When I was finished, despite the exhaustion, I wanted more. I simply love Canyonlands.